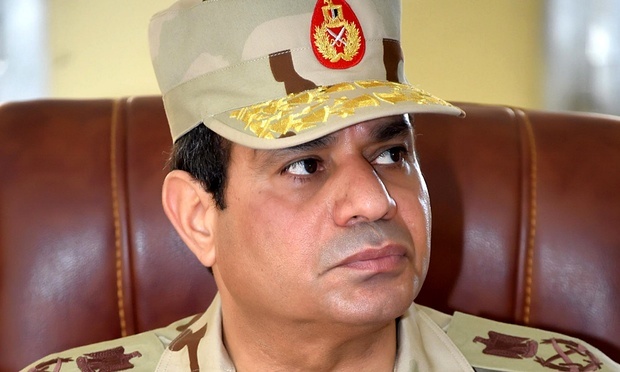 Two years ago General Abdul Fattah el-Sisi, defence minister in Mohamed Mursi’s government, became president of Egypt. He had led a military coup that toppled the Mursi government in July 2013, drowning the military’s Islamist opponents in blood. Since then, there has been no let-up in the state-organised repression of the el-Sisi regime’s bourgeois political opponents, liberal activists and the working class and repression is increasing as the cost of basic commodities soar. The judge in yet another kangaroo court sentenced former Muslim Brotherhood President Mursi to 40 years in prison following his conviction on charges of spying for Qatar by allegedly passing on classified Egyptian documents to the petro-state. He sentenced to death six other defendants, including two Al-Jazeera news service employees in absentia. Mursi is currently appealing a previous death sentence and another two sentences—life in prison and 20 years in prison—in separate cases. El-Sisi banned the Brotherhood after his takeover, declaring it a terrorist organisation. Since then, he has mounted a vicious crackdown against all opponents of the military elite that has dominated Egyptian political and economic life since the 1952 Free Officers’ coup. The government declared a three-month state of emergency in parts of the Sinai Peninsula in October 2014, which it has illegally extended across the entire Peninsula ever since. It was aimed ostensibly against the Bedouin and Islamist fighters in the impoverished desert region who have killed dozens of security personnel. But the curfews, detention without trial or even charges, shutdown of cell phone and internet networks, and routine abuse by the army and police have only inflamed tensions. The Egyptian state has outlawed protests, imprisoned tens of thousands, sentenced hundreds to death and introduced a sweeping counterterrorism law that vastly expanded the authorities’ powers. Mass trials, mostly of Brotherhood supporters, failed to establish individual guilt. Several thousand have been tried in military courts. Torture and enforced disappearances are commonplace, with many detainees dying in custody from mistreatment. The junta harasses and investigates independent NGOs and prosecutes journalists who dare to criticise its actions. Three leading members of the journalists’ union face trial for harbouring “fugitive” colleagues and publishing false news, after the police stormed their headquarters to arrest two reporters hiding inside the union’s offices on May 1. The media were banned from covering the preliminary proceedings. The regime has also targeted the universities, amending the law to allow the state to appoint senior university personnel and university heads in order to expel students. It has deployed security forces on campuses, arresting at least 790, mainly for protesting against the government, many of whom were tortured or abused. At least 89 were referred to military tribunals where some were sentenced to death or life imprisonment. According to officials from Egypt’s two largest universities, 819 students have been expelled since 2013. Some were Brotherhood supporters, while many others were protesting against abuses by the security forces. In February this year, Italian doctoral student Giulio Regeni, who had been writing his thesis about independent trade unions, was found tortured to death after disappearing on the January 25 anniversary of the 2011 revolution that toppled long-standing dictator Hosni Mubarak, when security forces were out in force in central Cairo. All the indications are that the top echelons of the regime were involved in the murder as it prepares to legislate against “independent” unions, with the official state unions filing a lawsuit to criminalise unofficial unions, many of them connected to Washington. The government is also seeking to shut down NGOs that receive overseas funding. Despite the crackdown on political protests, including a ban on a march on International Workers Day last month organized by independent trade unions, rising prices, low wages and delays in paying wages and bonuses are fuelling social and economic tensions. In the wake the 2008 global financial crisis and the political upheavals following Mubarak’s ouster, Egypt’s economy has gone into free fall. With its main foreign currency earners, the Suez Canal hit by falling trade and tourism by security fears, the Egyptian pound has plummeted. This, along with the price hikes resulting from the taxes and cuts in subsidies on basic goods imposed in 2014, new import duties on several products, including nuts and fruits, and restrictions on others, has sent prices, particularly foodstuffs, medications and fuel sky high. Inflation is now running at 13 percent a year and rising in a country where 40 percent of the people live on less than $2 a day and wages have not kept up with inflation. Prices are soaring in Egypt despite a UN Food and Agriculture Organisation report showing global commodity prices falling to their lowest since June 2010. So great is the fear that rising prices may lead to widespread protests that the government announced government stores would offer basic commodities at discounted prices. Egypt’s Central Bank has raised interest rates twice this year, to around 12 percent, to bolster the pound. This move threatens the already limited capital investment in Egypt, following its 14 percent devaluation of the pound, which set exchange rate at 8.85 pounds to the US dollar, compared to 7.73 previously. On the black market, traders are paying up to 11 pounds per dollar. Another devaluation is expected later this year. Egypt’s budget deficit rose to 9.2 percent of GDP in first nine months of this fiscal year, up from 9.0 percent in the same period last year. The el-Sisi regime is dependent on Saudi Arabia, the United Arab Emirates and the United States for its economic and political survival, with Washington providing at least $1.3 billion a year in direct aid. It was Egypt’s dire financial situation that led el-Sisi to transfer sovereignty of two strategic Red Sea islands at the mouth of the Gulf of Aqaba to Saudi Arabia as part of an economic deal to stimulate Egypt’s economy, although the courts have unexpectedly nullified the transfer. Under the deal, Riyadh is to provide Cairo with a $22 billion oil and aid deal, including loans of $1.5 billion to develop the Sinai Peninsula, $1.2 billion to finance Egypt’s oil purchases and a $500 million grant to buy Saudi exports and products. According to Egyptian NGO Democracy Meter, in the first four months of 2016 thousands have defied the ban on protests to take part in a total of 493 actions, ranging from work stoppages to peaceful marches and pickets. This represents a 25 percent increase from the same period last year. In the last month, workers have held sit-ins over unpaid wages in Cairo and at the port of Alexandria, Egypt’s second city. Security forces broke up the protests, arresting 13 workers and engineers who face the possibility of military trials since the Alexandria facility belongs to the navy. Heightening the political and economic crisis engulfing el-Sisi’s dictatorship is the scandal surrounding the leaking of the school-leaving examinations on which entry to university depends. The revelation has led to the cancellation of one of the examinations and protests by high school students, highlighting the deteriorating conditions of public education in Egypt where teachers routinely take charge of at least 60 students in a class and schools operate daily on a double-shift basis.